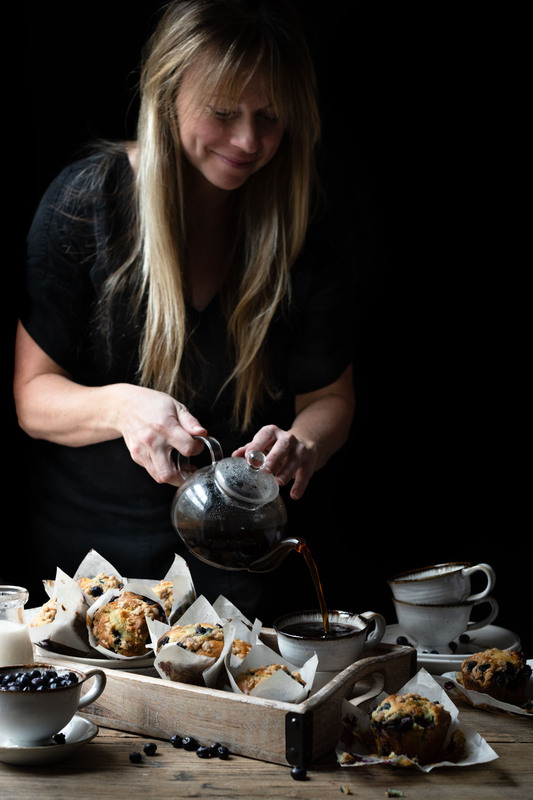 The best blueberry muffins a coffee lover could ask for! Delicious blueberry and coffee flavored muffins topped with a cinnamon crumble. Blueberry muffins recipe from scratch is about as classic as classic can get. They also happen to be the only way I would eat a blueberry until my mid twenties. Don’t get me wrong blueberry pies, tarts, and smoothies are all fabulous, but a warm blueberry muffin with crumb topping is my comfort food. I’ll take two please with honey and warm butter on the side! This muffin recipe is super easy! 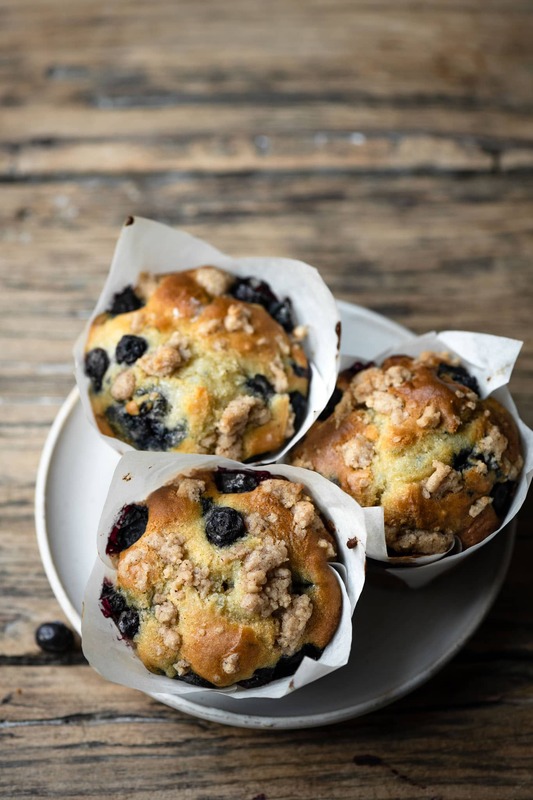 Basically mix the ingredients, scoop batter into muffin liners, top with crumble and extra blueberries. Slide those babies in the oven while you brew a cup of coffee. I store the uneaten ones in an air tight container to save for breakfast all week long. 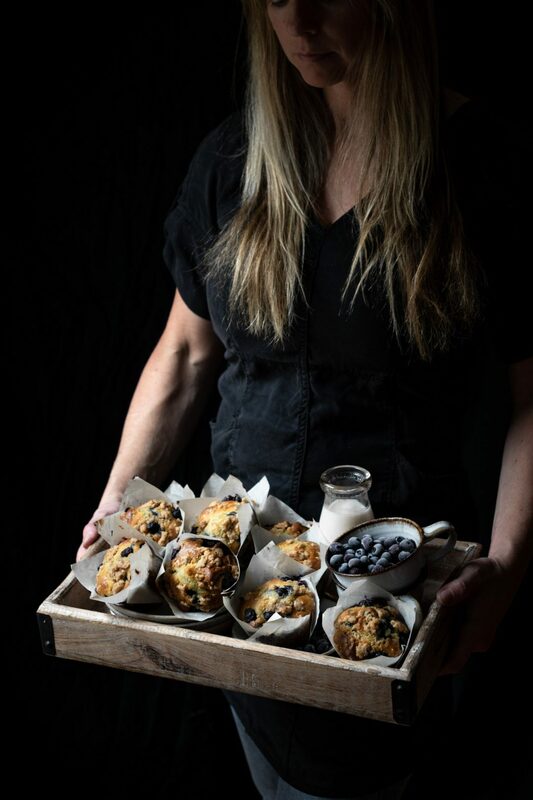 Simply grab a muffin, wrap in a paper towel, heat for about 15 seconds and whala…warm blueberry muffin to go. Is there such a thing?! I’ve never tried blueberry infused coffee, but I would definitely love a cup. For now, I will just blend my favorite brew with fresh blueberries and make tasty treats:) If you happen to find a Blueberry Coffee brand let me know please! Plain Greek Yogurt helps to add moisture to your baked goods. It is lower in sugar than flavored yogurts and can be used a substitute for sour cream, butter, and oil. For this recipe I chose to use greek yogurt to help create a light fluffy texture to my easy blueberry muffins. The acidity in the yogurt reacts with the baking soda creating a “rise” in the batter. Use large or petal shaped muffin liners. This is a thick batter, so you will have to push it off the spoon with your finger tip. Mix wet ingredients with paddle attachment. I made this blueberries muffins with oil for a soft texture. Feel free to swap out the olive oil for coconut oil or vegetable oil. Slowly spoon in flour mixture while mixer is on medium speed. Once incorporated turn off mixer. Coat blueberries lightly with flour to keep them from sinking in the batter. 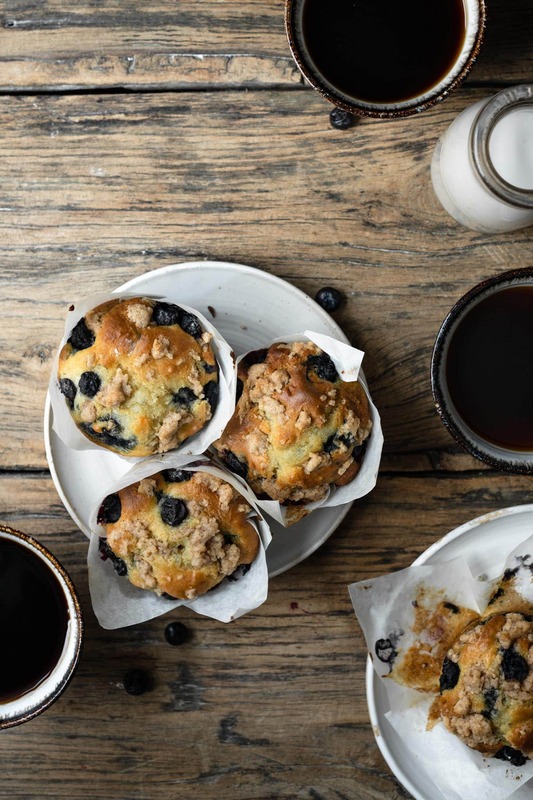 You can also make these coffee blueberry muffins with frozen blueberries! Fold into batter with a spatula. Be generous with the blueberries, I add a bunch! Fill muffin cups 2/3 full with batter. If you have large liners, you may only fill 10-11 muffins. Generously sprinkle crumble on top of batter. Bake until toothpick comes out clean or top of muffin springs back when lightly pressed with fingertip. 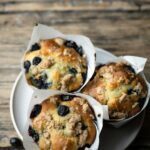 Recipe for Blueberry Coffee Crumble Muffins, the best blueberry muffins a coffee lover could ask for! Delicious blueberry and coffee flavored muffins topped with a cinnamon crumble. Stir together ingredients in a medium bowl using a fork and set aside. In bowl of stand mixer with paddle attachment blend together sugar, eggs, yogurt, oil, vanilla, and coffee. Next pour in flour mixture and thoroughly incorporate at medium-low speed. Toss 1 1/2 cups blueberries in 1-2 Tbsp flour for a light dusting. Gently fold blueberries into batter by hand using a spatula. Evenly distribute the batter amongst the 12 muffin wells. Top batter with remaining fresh blueberries. Finally add your crumble sprinkle, using as much as you like! Bake for 20-25 min or until toothpick comes out clean. Cool in tray for 5 minutes and then remove muffins. Serve warm with a fresh cup of coffee! I wouldn’t have thought to combine coffee and blueberries but this looks amazing! Can’t wait to try! Thanks Karly! Just enough to get the flavor! Love these muffins:) Let me know if you do! Looks beautiful and delicious! Do you make your own muffin liners? if so, I’ll need to to learn how! Hi LinLin! Thanks so much! I believe these are Paperchef Tulip Cups! !